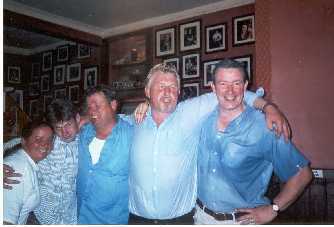 After session photo in the Cobblestone, July 2003. John Rooney and Néillidh Mulligan. Leo Rowsome made this unique set of pipes in the mid-1950's for Felix Doran. Felix wanted a silver set and therefore they were designed by encasing the wood in metal, which was in turn silver-plated. The metal is ornately decorated with the highlight being "Felix Doran" engraved on the stock separated by a harp The pipes were engraved by a traveller at a fair some time after. The price of the pipes was originally 150 guineas. Felix often related the stories of his many trips over to Dublin to collect the pipes from Leo, which took longer to make than they both expected. Usually when Felix discovered that the pipes were not finished he would stay, mostly for a week at a time, playing music in various hostelries in Dublin and elsewhere. On one occasion he stayed so long that his wife decided to come across to Dublin to re-emphasise his family responsibilities. As she set out across the Irish Sea to Dublin by boat, Felix had already boarded a boat in Dublin heading in the opposite direction to England. Felix related that the two boats met halfway across the Irish Sea! The cost of the pipes certainly exceeded their original price. Felix won first prize at Fleadh Ceoil na hÉireann in Mullingar in 1963. Tom Mulligan playing Felix Doran's Rowsome made set in Dromard House, Bornacoola, Co Leitrim, in 1981. Tom Mulligan met Felix who accompanied by his son Michael Doran, a gifted 13 year old piper playing a full Kennedy set of pipes at the time, at Fleadh Ceoil na hÉireann in Clones in 1968. A bargain was struck and Tom agreed to purchase the pipes for his son Neil who had just won the All-Ireland under 14 piping competition. 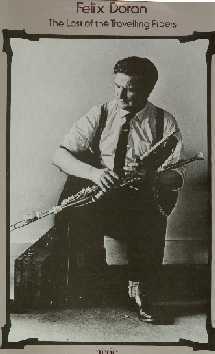 Felix subsequently sent the pipes over from Manchester with his wife who delivered them in a bag to John Kelly's shop in Capel Street, Dublin, minus the drones, the bag, bellows and the chanter to await collection by Tom Mulligan. Tom himself had been making chanters on Matt Kiernan's lathe and made one with a silver-plated head to go with the Doran set. The base drone, made from ebony with a silver-plated tuner and sound box, is a John Clarke drone presented to Tom by Seán Seery, the Dublin piper, at a party in Larry Dillon's house in Monx Place, Phibsboro. (Seán was a former pupil's of Leo's and a member of the famous "Leo Rowsome Quartet"). The tenor and the baritone drones where made from ebony and silver-plated brass by Matt Kiernan who made many sets of pipes from his home in Offaly Road, Cabra, Dublin. The original drones were retained by Felix and had matching decoration to that on the top half of the base regulator. He used these drones on the Silver Set that he subsequently got made by a German engineer, who promptly stated when he saw Felix playing the Rowsome set, "I could make a set of those"!He subsequently did! 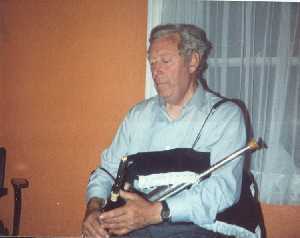 Tom gave the pipes to his son Neil who played them from 1968 until he gave them in1984 to his brother Alphie, who is playing them since.After many years of searching for a Rowsome chanter for the set, Neil finally purchased one from Dave McGrath in the late 1970's and are now part of the Doran/Rowsome set. A picture of this set in it's original format can be seen on Felix Doran's LP cover entitled 'The Last of The Travelling Pipers'. Felix died in 1972 and was brought home to Ireland to be buried in Rathnew, Co. Wicklow. Ar dheis Dé go raibh a anam uasal ceolmhar. The German-made silver set were brought over to be played by his son Michael at the grave. Sadly, when the pipes were taken out of the case it was discovered that the solid silver chanter was bent and unplayable. 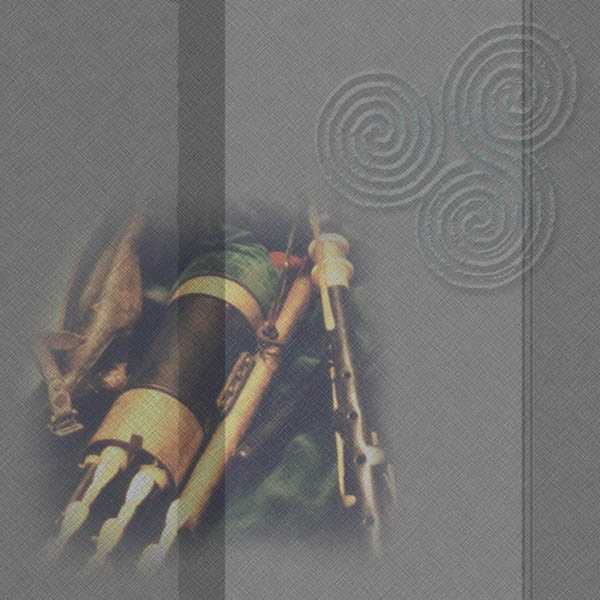 It was believed that the chanter was either bent when someone sat on the case on the boat trip over or when they were given to a wreath maker to make a wreath in the shape of the pipes. Neil offered Felix's Rowsome set to Michael which he played for a short while and he then asked Neil to play. Seán Reid counted 75 wreaths at the graveside. Seán also wrote the sleeve notes on Felix Doran's LP The Last of the Travelling Pipers.